Reading the many digital photo software reviews on different web sites can be very time-consuming. There are so many photography software review sites that it could take you months to figure out what software editing program is best for you. It's best to read the reviews from actual consumers and Amazon is one of the kings of online software reviews. The CS stands for Creative Suite and means this bundled software includes photo and video editing, graphic design, and web development applications. I've been a Photoshop user since it's early windows version in the mid-1990s. Each new release adds extra features and power. Photoshop cs5 was released in April of 2010. The cs5 version had upgraded it's frequently used Tools, has more natural looking painting and great HDR, High Dynamic Range capabilities. It's most amazing feature is called Content-Aware Fill. You can replace a distracting element in your background with a natural looking replacement that matches. This one feature alone can make the average photographer capable of producing great digital photos. It works amazingly well in most situations and sure beats the time-consuming use of the clone tool. 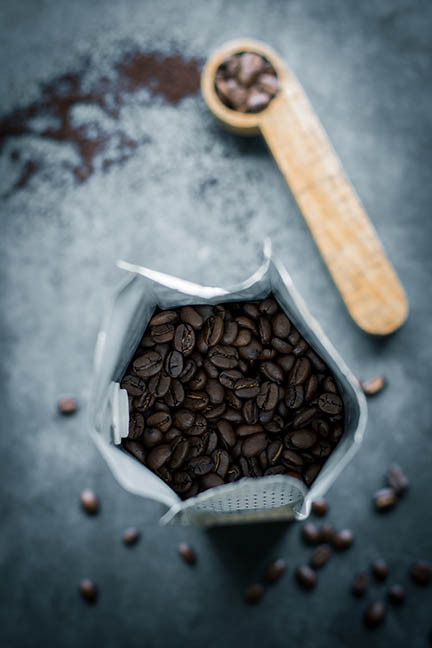 For those that don't quite need the complexity of Adobe (new window will open) Photoshop CS, the Photoshop Elements series is a great choice for most photographers. 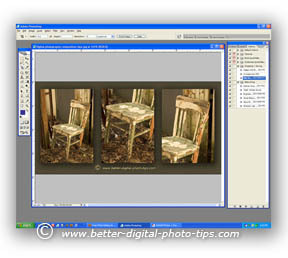 Photoshop Elements 9 was released in September of 2010. It has two programs combined into one. It has the photo editor as well as an organizer. It also lets you upload directly to Facebook and has a real cool People Recognition feature. There are the standard AutoFix tools in the organizer section that can take care of color, red-eye and contrast and other basic retouching. You can use a brush tool to adjust certain areas of your photo with a variety of effects. In today's world, it's all about sharing. With the explosion of communication channels such as the internet, texting, emailing, Facebook, twittering and blogging, our society shares more than ever before. Photoshop Elements software lets you easily share photos in a variety of ways, including web-TV, iPhone photos and emailing. The email option has frames and an address book. You can print single prints, packages or contact sheets. The Slide-show feature lets you add your music or your voice. Clip art, frames and custom text can be added. You can do a photo share by creating books, scrapbook pages, labels for DVD, holiday cards or calendars. 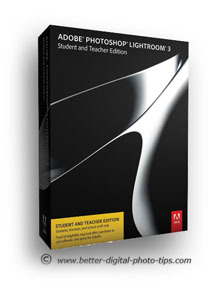 Adobe Photoshop-Lightroom 3 was released in 2010. This is photography editing software that is designed for professionals, but is really great for hobbyists and amateurs too. It's all about time and work flow. 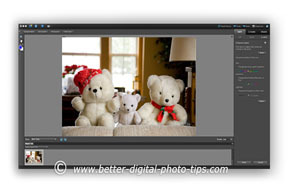 Lightroom 3 makes the process of adjusting large batches of photos quick and simple. It does take some effort to learn the software initially, but it's well worth attacking the learning curve. LIBRARY. The library module gives you a fast way to name, organize, label, filter your photos in a variety of ways. It has a few compare modes that are a great help to narrow down the number of photo you want to use.. DEVELOP. 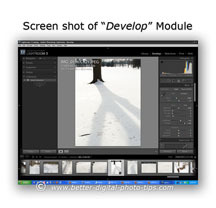 The Develop module is where I am most excited about the newest version of Lightroom. You can apply adjustments to exposure, brightness, contrast, color, tint, sharpness and more to a few selected or all of the photos in your file. The Noise Reduction capabilities are amazing. SLIDESHOW. Slideshow module, as the name implies, let's you create slide shows with whatever photos you select. It has a large number of options such as: borders, shadows, background choice, watermarks, copyright, overlays and lots of ways to control each one the options. You can add music or other audio clips as well. PRINT and WEB Modules. The Print and Web modules speed up producing your final output, printing or putting on the web. 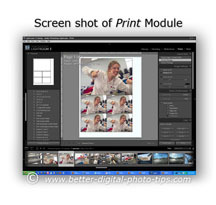 This software module has a great preview for printing multiple photos on a single sheet of paper. The updated version has a way to load your photos to Facebook too. It does take an investment of your time to learn, but it is so worth it my fellow photographers. In addition to digital photo software reviews, please explore other digital photography tips such as photo composition, lighting, posing, exposure and digital camera settings. A great source for getting specific digital photo software reviews by customers who have purchased a certain software is to use the reviews on Amazon. Read the reviews that have a one star rating first and see if they are well written by a knowledgeable person. I read a lot of reviews and after a while you can tell if someone has a real legitimate complaint about a product. Some digital photo software reviews on Amazon complain about their purchase and not really about the software. Thanks for stopping by and enjoy your photography editing software!